Wild Games may seem rather basic at first glance, but don't let that fool you, this is one power-packed online slot. The 5 reel and 25 payline slot by Playtech has a sports-theme that is presented by 3 lovable animal characters that take part in various Olympic-style events. There is a muscular Leopard that competes in a 100m dash, a Bulldog that swims freestyle and a Hippopotamus who graces you with a gymnastic routine. You need to land stacked Bulldog symbols on reel 3 to activate the Freestyle Bonus. Once activated you need to choose one of the three Bulldogs to partake in a swimming competition. You Bulldog comes in either first, second or third and wins a gold, silver or bronze medal. 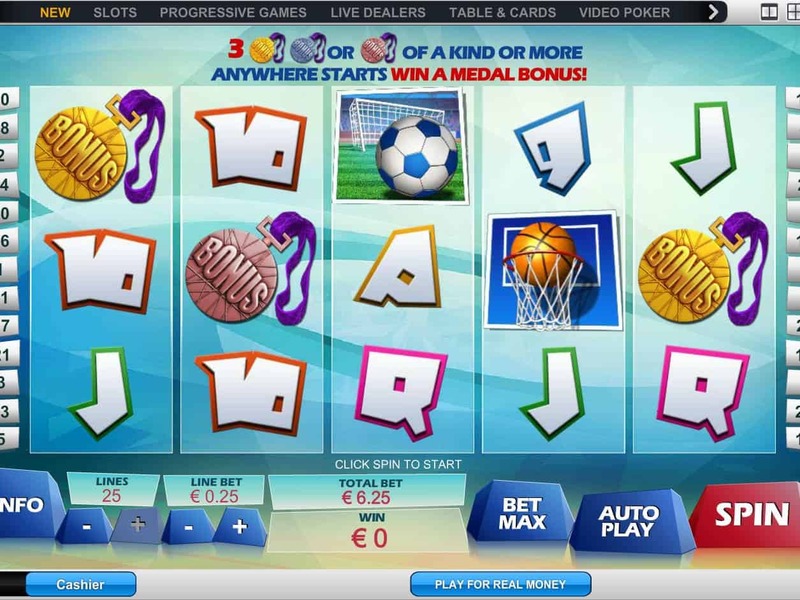 You are automatically awarded 8 free spins after the swimming competition and the relevant medal is added to the reels. By landing the medal in your free spins round, you are awarded additional free spins. The bronze awards 2, the silver grants 3 and the gold gives you an extra 4. The Sprint Bonus round is unlocked by landing the stacked Leopard symbols on reel 3. Choose 1 of 3 Leopards to run the race and again you win either a bronze, silver or gold medal. During your 8 free spins, the medals are Wilds. The gold medal is an expanding Wild, the silver works as a normal Wild but turns one extra symbol Wild and the bronze medal is an extra Wild. As with the other animal bonuses, this Bonus round is activated by landing the stacked Hippos symbols on reel 3. You need to choose a Hippo to partake in one of 3 gymnastics events. Depending on which you chose, you win multipliers, which are added to your bet level, of between 6x and 10x. If you happen to land 3 or more of a Medal symbol that are all either bronze, silver or gold you get the chance to pick one of these medals in return for a mystery cash prize. Bronze medals payout the least while Gold medals payout the most. 9, 10, J, Q, K, A, Soccer Ball, Basket Ball. The Wild is the Trophy icon and it can replace all the other slot symbols barring the 3 Medal symbols. There are 3 Scatters in the Wild Games; the Hippo; the Dog and the Leopard. They overlap, acting also as Wilds, as well as unlocking bonus games. There are 3 Bonus symbol namely a Bronze Medal, a Silver Medal and a Gold Medal. Landing 3 of a kind unlocks a bonus feature. Wild Games is a truly enjoyable game that has gone above and beyond in terms of its bonus features. It is unusual for such a relatively unknown slot game to have this many awesome bonus features. The graphics are top of the range and the characters Playtech has designed for the game are lovable and even comical. The RTP of almost 97% is the cherry on top for this amazing slot game.